I tend to gravitate towards trails that are long, technical and can easily turn into death marches. Like most anyone, I love epic adventures. And epic adventures, in my opinion, need to have some sort of danger involved for them to be, well, epic. But on occasion I like to ride the easy stuff. Sometimes it's because all the other trails are covered in snow and downed trees or maybe my wife broke her hand and we need to take it easy. Other times, it's just because there isn't time for a seven-hour death march. Whatever the reason, there are a lot of short, easy, fun trails out there. The Navajo Lake Loop Trail is one of these. Navajo Lake can be found on top of Cedar Mountain about 25 miles east of Cedar City. The lake was formed by a lava flow, of the kind that is typical of the area, that dammed water flow. The lake sits at 9200 feet so bring your lungs. 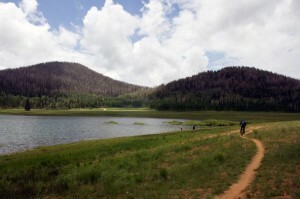 The Navajo Lake Loop Trail does exactly what the name suggests, it loops around the lake. It does have a few small climbs and almost no technical sections. This is one of those rides that you can take your non-cycling friends on and everyone will have fun. There are plenty of spots to stop and take in the scenery. This includes places where access to the lake is phenomenal. If you are a fisherman, bring the pole and turn it into a fishing/biking adventure. There are two main ways to access the trail. There is a trailhead on the east and west sides of the lake for the trail. I prefer to start at the east entrance just off the main road and ride towards the east doing the north portion of the singletrack first. This access is marked by a big sign. Simply pull off to the side, get ready and go. Most of the time you will see several cars parked here enjoying the trail ahead of you. This is also a great spot to start if you are riding with less experienced riders. From this access point you have about five miles to the other end of the lake. All of this is on singletrack and is flowy and fun. Once you reach the other trailhead, you have a few options. If you are riding with beginners, let them cruise the dirt road back to the car. Or if they are feeling up to some more riding hit the other side of the loop and follow it back. The South section of singletrack has a bit more climbing, not a lot, but at 9200 feet a little can seem big to a new rider. My personal favorite variation is to hit the Virgin River Rim Trail. This will give you some more climbing and add a mile or two, depending on your variations, to the total distance. Where this is a highly trafficked area there are signs showing you where to go. Simply follow them to the Virgin River Rim and bingo. Once on top you have several options to come back down to the loop. My favorite is the Dike trail. All of the options will bring you directly back onto the loop trail. This section of the Virgin River Rim Trail is absolutely beautiful. The trail is nice with very little loose stuff. Even the climbs are mellow as they meander up to the top, except for a couple of short sections that are steep. If you have the time and the legs, this is a must. You will not regret taking the time to ride this, trust me. If you prefer to stick with the Loop Trail, again follow the signs. However, I need to give a warning. According to all the guidebooks and trail maps, the loop continues off of the Virgin River Rim Trail. I have missed the turn off every time I have ridden the trail. So be careful if you don't want to end up pedaling up to the top of the rim. Once you find the trail simply follow it back to your vehicle. Or, if you are like me and can't find the turn off from the VRRT, ride back towards your car on the dirt road. Pay attention to the roads to your right. You will see a short dirt road where there is another access to the trail. This is the Lodge Trail. Once you are on this trail simply head the same direction you were going and it will take you directly back to your car. These directions are for riding the loop counterclockwise. I prefer this because it allows you to get in a good warm up on the easy side while enjoying the scenery and flowy trail. Once warmed up I can enjoy the climbing up to the Rim or the little bit of extra energy required to ride the other section of the loop. Of course, it can be ridden both directions. So if you are looking to introduce some new riders to the beauty of mountain biking or are enjoying an easy afternoon, check out Navajo Lake. You won't be disappointed unless you were looking for a death march. Take U-14 up Cedar Canyon for about 25 miles. Turn once you see the signs for Navajo Lake. Follow the dirt road until you see the sign for the Navajo Lake Loop Trail. Navajo Lake is excellent for fishing, hiking and plain old sight seeing. The Virgin River Rim Trail offers some spectacular views. 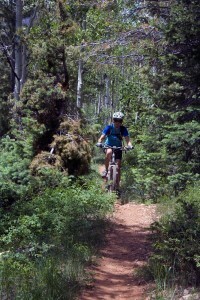 Brian Head Resort is within a half hour of the lake and has shuttle assisted mountain biking trails. And Frisbee Golf. Duck Creek Village is about a half hour away as well and has all the motor assisted recreation your heart could desire. One Response to "Navajo Lake Loop Trail"
How many miles is this ride?